On the 1 September Celtic Mist returned to the continental slope of the eastern edge of the Porcupine Bight,which includes the Belgica Mound Special Area of Conservation (SAC) for deep water corals. The same time last year Celtic Mist recorded an amazing 11 species during the week including blue and fin whales on the shelf edge. Celtic Mist steamed south to a point just north of the Goban Spur and continually observed and acoustically detected dolphins for much of the way south as well as had an encounter with a large Leatherback turtle. Common Dolphin Eastern Porcupine Bight Shelf 2 Sept 2013 (Patrick Lyne- IWDG). However this year we did not encounter large number of baleen whales which were so abundant last year. We did see many fin whales and many other whales too far away to identify. This year’s remarkable encounters included two beaked whale sightings, the first of which was on the 4 September at 11.30 hrs involved three animals that passed within 50m of the vessel. These three animals were almost certainly True’s beaked whales but from the photos cannot be distinguished from Gervais beaked whales. These animals first seen alive in 1995 and with only two confirmed sightings in the wild must be some of the most rarely seen animals on the planet. Mostly they are only known from strandings of already dead animals. While Gervais whales are more common they are considered a vagrant in Irish waters and are less likely to be present. There are no confirmed recordings of vocalisations of either species and unfortunately our acoustic equipment which had been working perfectly until this time suffered a failure just at this moment. 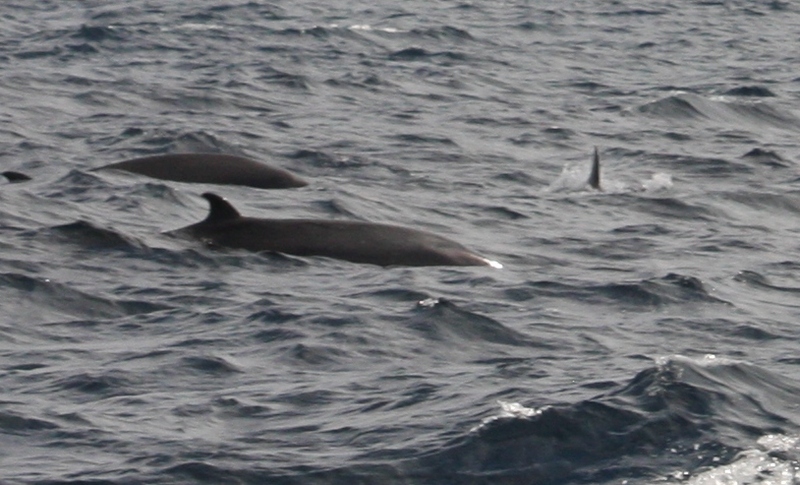 The following day we were treated to another sighting of beaked whales, this time Northern bottlenose whales. Sightings of these animals are infrequent in Irish waters but they are some of the best known species of beaked whales. Probable Trues Beaked whale Eastern Porcupine Bight 4 Sept 2013 (Patrick Lyne- IWDG). Returning to shore at Knightstown on the 5 September we continued north the following day via the Blaskets to Fenit, Co Kerry. Some 15 miles west of the Blaskets we were treated to a fabulous feeding display with Gannets and shearwaters and hundreds of Common dolphins chasing large amounts of fish in the water. A pair of Humpback whales and several Minke whales completed the scene with occasional displays from the Humpbacks that we have taken to characterise the species. The smaller juvenile Humpback on occasion breaching clear of the water. 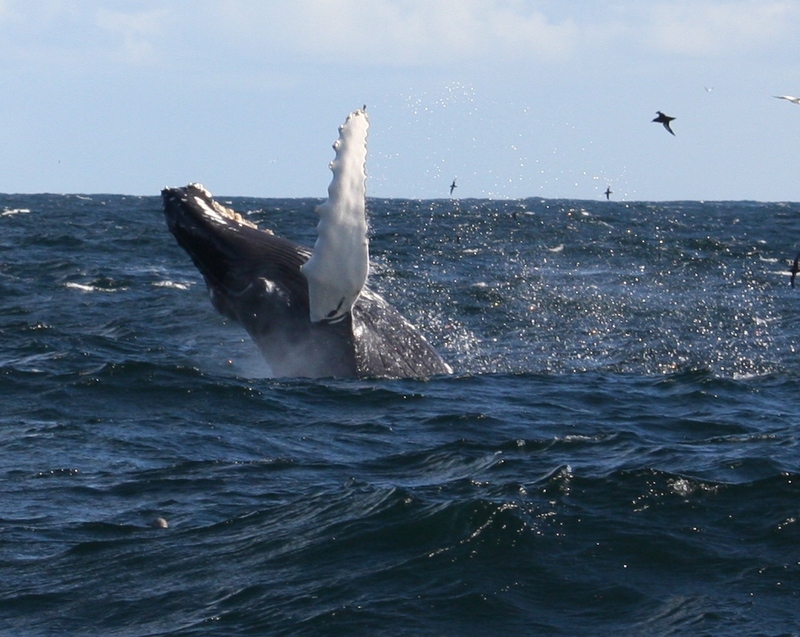 Juvenile Humpback breaching off the Blaskets 6 Sept 2013 (Patrick Lyne – IWDG). This year’s cetacean species count was somewhat lower with eight species encountered but added to this the Leatherback turtle and small shoal of Tuna produced an interesting varied example of what Ireland’s offshore environment has to offer in a relatively short space of time. BBC film Humpback Whales off Kerry Coast.